As many will know, EA announced that it was shutting down Visceral Games today, leaving the careers of the staff, and the future of the games that it was working on, in complete limbo. There is a lot wrong with this decision, and how EA justified it. A lot of which is covered in other articles, and I'll avoid re-treading there. But there's something in particular that I wanted to emphasise with a complete article, because it represents a really dangerous way of thinking about the value of games, and ultimately won't end well for anyone. 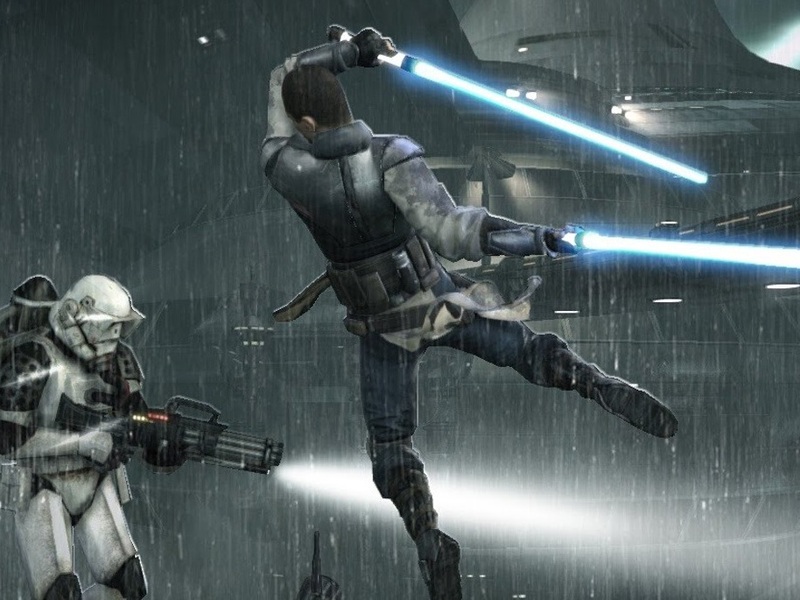 According to a blog post on the studio closure, EA Executive Vice President, Patrick Soderlund, wrote "Our Visceral studio has been developing an action-adventure title set in the Star Wars universe. In its current form, it was shaping up to be a story-based, linear adventure game. Throughout the development process, we have been testing the game concept with players, listening to the feedback about what and how they want to play, and closely tracking fundamental shifts in the marketplace. It has become clear that to deliver an experience that players will want to come back to and enjoy for a long time to come, we needed to pivot the design" (emphasis mine). There we have it, in plain English; EA shuttered Visceral's game (and the studio itself), because it was making a single player game, and single player games are finite. EA, like most of the big blockbuster publishers, want games that are effectively infinite. Games that people point to their Steam clocks to show they've played for hundreds and hundreds, if not thousands of hours. Single player games simply can't make enough money, because infinite games, with their loot boxes and microtransactions and endless expansions, make so much more. Basically Visceral was building Star Wars: Uncharted (Amy Hennig was working on it, after all), and EA wanted Star Wars: Destiny, or Star Wars: Overwatch. And so heads rolled. Look. We've all at some point equated time played with a measure for the quality of a game. I've openly boasted about having spent well (well) over 1,000 hours on the various Hatsune Miku games. Perhaps I shouldn't actually be "boasting" about that, but I wouldn't play a game for that length of time if I didn't think it was the most amazing experience, right? No one spends more than a couple of hours playing something they absolutely detest, and we live in a world where games are pushed out as marketing platforms rather than works of art - and to marketers, time spent in a game means "engagement" and from their perspective that is a good thing, because engagement directly translates to sales opportunities. That's all they care about. They've got loot boxes to sell. But from a artistic and long-term economic health perspective, you never want to leave a game up to the marketers, and in reality we all need to stop using "hours played" as a measure of quality. The more stuff - or content, as the marketers like to say - that's in a game, the more it takes to actually make that game. Sound enough logic, right? You can write a short story more quickly than you can write a sweeping epic novel, and you can make a game that's four or five hours in length more quickly and at lower expense that you could make a game that's 100 hours in length, or longer. A small development team could do the former in a year or two. To do the latter in three or four years you'd still need a sizable team. And with that comes additional management and training expenses. And additional QA expenses, as each person on the team is contributing a smaller fraction to the overall picture, so the overall picture "breaks," much more easily. The point is, that the bigger a game, the more it costs to actually make the game. So, as the size of the game escalates, the risk profile of that game escalates in turn. It becomes harder and harder to take risks within the game itself, because if people don't like your game for being different, sales plunge and because you've invested so much into the game, your creditors are left very angry indeed at the debt left behind. Contrast to that small development team, which had a hit, and then took a gamble and made a game that was a big 'ol miss, but because there was relatively small amounts of cash in developing that second game, the success of the first absorbs the losses in the second. No angry creditors. No house foreclosures. No studio being shuttered. So much of what's going wrong in the AAA blockbuster industry can be traced back to this dynamic. Developers and publishers can't afford to take risks, because the "safe" project that they're working on is absorbing so much money that it's a risk simply in existing. You don't double down on the risk there. Not when thousands of people - from employees to shareholders - have put their livelihoods in your hands. On top of this, because the AAA blockbuster industry is targeting endless player engagement, they need to continue to dedicate resources to the game. Those resources continue to cost the project money, and sure it might work for something like Overwatch, which is maintaining a community, but what about Titanfall 2? Evolve? Battleborn? These games come, fade, and disappear incredibly quickly because not only do they not set the world on fire with initial sales, but the small communities mean the game continues to hemorrhage money as ongoing development costs aren't exceeded by ongoing revenue. In desperation the game goes on Humble Bundle, only for the publisher to discover that a person that's spent $1 on a game is going to be happy to use the game's servers and ongoing support, but is unlikely to care enough to invest further in the game. And finally the wall is hit, development of the game stops, and it's lost to history. Meanwhile, over in Japan, most developers and publishers are constantly creating new IP and surviving through some horrific Metacritic scores, and they're able to do that because their projects are economically safe, and therefore they can escalate the creative risk. The same goes for small, independent developers and publishers, up to around the size of Ninja Theory. The result is that just about every genuinely creative game that has been produced over the last couple of years has been either a Japanese or indie title. I'm really struggling to think of a single western blockbuster that has done something genuinely innovative - they look great, and play well, but they're endless iterations on one another, packaged up in ever-escalating costs to out-do the the others in terms of audience engagement and hours played. Actually, I take that back. The big developers and publishers have innovated all kinds of ways to convince people to invest more money in them. They have to, else they can't sustain on-going development on the game. Loot boxes, DLC, microtransactions. All that kind of stuff. Developers and publishers of blockbuster games have become very innovative in how they ask for money. The problem is that there are only so many ways to build a game around these monetisation models. Single player, narrative-driven games, as EA has just demonstrated, don't really work with this kind of monetisation. Multiplayer-focused, competitive games, however, do. So these big blockbuster developers start to limit their creative range to things that they can squash into these monetisation models. And, it's worth noting, what fits this monetisation model doesn't lend itself to telling stories of the ages. When you're asking people to continuously spend money, what works is quick, instant satisfaction. Not careful reflection or focused, in-depth storytelling. Case-in-point, nothing of what EA's Soderlund wrote about in the blog had anything to do with 'art' - nebulous concept as it is - whatsoever. It was clearly, explicitly, all about using game development to keep players playing. "Importantly," he wrote. "We are shifting the game to be a broader experience that allows for more variety and player agency, leaning into the capabilities of our Frostbite engine and reimagining central elements of the game to give players a Star Wars adventure of greater depth and breadth to explore." You could argue the "greater depth and breadth to explore" implies "deeper" storytelling, I guess. But that would be ridiculously optimistic. Realistically we all know that it merely means "more stuff in the game," especially since the entire reason that Visceral was shut down was because it was making a storytelling game. In pursuit of hours played, creativity doesn't actually matter. They're actually mutually exclusive terms, since creativity must be finite, and no one can sustain a single creative strand indefinitely. Content matters. For context: I'm reading Romance of the Three Kingdoms, one of the lengthiest books you could possibly imagine. My Kindle is approximating that it will take me 50 hours to read it through. That's less than half the time that it took to play Persona 5, and compared to one of the greatest and most important Chinese novels ever written, Persona 5 (good as it is) is not in the same ballpark of creativity. For an even more extreme example; I can read through one of Shakespeare's plays in a couple of hours of an evening (and with a glass or ten of wine to boot). Good luck making a game with any kind of budget that can be completed in three or four hours without the Internet exploding at you. You don't need "length" to tell a great story. You don't need to occupy a person for hours to make them appreciate a painting. Content doesn't matter for art, or creativity, or whatever you want to call it. Content only matters if you don't care about creativity. Somewhere along the line we've all lost sight of that. We've fallen for the marketer's desire to have us care about time played. A game that's "too short" gets criticised. A game that doesn't take 50+ hours to complete has no chance of getting a game of the year nod. We call it "value for money," but what we're actually doing is participating in the dismantling of creativity in games in favour of what a businesses' marketing function wants. Visceral is the latest victim of this consumer attitude, and EA has merely (correctly) read the environment. I don't blame EA for what it did to Visceral. Because EA's simply supply demand. If we want it to change we need to adjust our own attitudes, and stop watching the game's time clock just to prove on Twitter how "epic" a game is. Just stop doing it. For the industry's sake.